My dryer decided to die on me over the weekend. It won't heat the air. Now, while this makes me incredibly sad, it doesn't bother me nearly as much as the dishwasher dying did. I'm trying to be frugal and make do. (Although what I really want to do is run to Sears and buy these pretties. At first I tried to just air fluff everything. But when the air outside is only in the 30's and 40's, air fluffing was taking 2 days per load. (And if you know the amount of laundry this house produces, that just won't do.) I wouldn't mind a laundry line in the backyard. 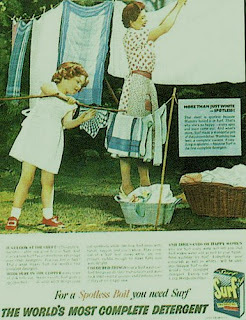 In fact I think it might even be fun to carry my laundry basket outside, while wearing a lovely apron and my high heels, pretending to live in 1950. But again, snow and rain makes that a bit of an impossibility. So I did the next best thing. Isn't that beautiful? I'm thinking its going to be all the new rave in only a matter of weeks. Neighbors are going to envy me and want this new decor in their own entryways. And it never leaves you bored; everyday you get a new color. Today, we will have pinks and reds. In the mean time, Jarom has taken apart the old dryer and googled all he can about electricity and dryer problems. We think we have the problem figured out and a new part is on its way. I'm crossing my fingers! I'm very proud of Jarom, this isn't his normal route. He would rather pay big bucks and have somebody do the fixing for him. Doing it himself puts him in the mood of all moods. (Everyone just steer clear.) But this time around, I think I've only heard him swear once and all of a sudden he has this new found interest in electricity. Who knew? I clean my lint traps regularly, and even vacuum out the little tunnel where it disappears. I thought I was doing an okay job of staying fairly lint free. Well, upon inspection of the inside of the dryer, not only did Jarom pull out a full grocery bag's worth of lint, but we found this lovely little charred bit on the back by the heating element. YIKES! I guess we're just lucky the dryer quit and didn't burn the whole house down. So while you're all in the mood to spring clean, open up your dryer and clean it out before you burn your own house down! Just trying to save your lives here. Have you ever wondered if Duncan or Betty takes the cake? No? Well, I have. So just for fun, I decided to have a taste test. Hold on to your seats ladies and gentelmen; this is going to be a battle to the bitter end. "Let's get ready to ruuuuuummmmmbbble!!!" Entering the ring we see Duncan in his flashy look-at-me box on the left, with Betty quietly biding her time on the right. After the mix up, Betty is looking smooth and a little flat in her pretty pink pan. Duncan's got some depth and and lots of little crunchy bits still hanging around. Hmmmm....fairly even ground directly out of the oven. For the final round, gather your highly scientific team and lay Betty on a "Happy Birthday" napkin, and Duncan on a white napkin. Don't forget a glass of milk to cleanse the pallet in between. Duncan may have won in appearances all around, but Betty had him beat by a mile in taste. And served with a little hot fudge and ice cream, Betty never looked or tasted better! Way to go Betty! We enjoyed watching Carter play soccer. His first "real" game. (Which isn't real at all, it's a scrimmage of 3 on 3 with no goalie, but its the first time he's done more than learn skills.) This was hilariousness at its best. SOOO so funny to watch these little kids. They didn't care what goal post, what part of the field, or who's game they'd entered. As long as they were kicking the ball and trying to get it near a net (even the backside) they'd run like the wind. Oh it was so funny, but you really had to be there to understand. We also took advantage of the weather and took a family bike ride. (Kate didn't go in her princess dress, but I had to put this picture in because I love it.) We strapped Kate and her bike into the carrier and took off. (She rode her own bike for about a mile stretch and would have gladly ridden more, had her mom not been so nervous. She's a drunken little bike rider!) We rode and rode, enjoying the scenery of the river, bald eagle, and rock chucks along the way. Finally we ended up down town by the falls. (Or in "upside down town as Carter says.) Look how high the river is right now. It all but touches the bottom of the bridge. We snapped a family shot and then decided to take a break and eat some dinner at Jalisco's Mexican restaurant. (The Mexican Pizza is really yummy. Halle ordered it for herself, but I ate it. The refried beans are great, but the rice and enchiladas were a little too salty.) We got back on our bikes and began the trek home. It was a wee bit chilly that leg of the ride, but we made it home safely and no one cried or complained the entire day. That in itself is a miracle worth writing down. After we got home, we decided we needed a treat (Reed's Dairy Ice Cream). I mean, we did just get done with our exercise for the day, we deserved it. (Oh I am SO flawed in my thinking...it is NO wonder I can't lose a pound.) So we hopped in the truck and drove the route we had biked earlier. We realized we had gone 10 miles round trip! I couldn't believe my little kiddos rode that far and didn't even act tired. The next morning the blue skies and green grass had given way to a spring snow storm. Poor little robin hoping to find worms on the wet sidewalk. Thankfully the snow didn't stick around long and by the end of the day, the grass was back. Hope you all had as wonderful of a weekend as we did! Since I am (a) FaceBook challenged and don't know how to make a "note", (b) a bigger fan of blogging, (c) slightly narcissistic and want my answers printed in my blog book, and (d) want you all to do this on your own blog, I am accepting Emily and Trish's FaceBook tags and doing it on my blog. Three (or so) more things- Now, here's what you're supposed to do (if you so feel like it)...and please do not spoil the fun. Create a new note (or post on your blog), copy and paste this message, delete my answers and type in your answers. The theory is that you will learn a lot of little known things about your friends and family. Have FUN! 2. A new kitchen table...someday. 3. The day when my house stays clean. 1. Kitzi, Teiko, Friend, and Molly (some of the bazillion cats I had as a kid). 2. Happy & Mercedes (crazy nut job basset hound and sweetest schnauzer ever). 3. Chee Chee and Cha Cha (Parakeets) (I had no idea what a "chi chi" was). 4. Dandy (my homing pigeon). 5. And the current Johnny (schnauzer) and Mimzy (guinea pig). Whenever I take Carter to Wal*Mart he screams "Hey! There's Wally!" "Yep son, we're at Wal*Mart. I didn't know you loved it so much." But the screaming and pointing continued until one day I realized he didn't mean Wally as in good ol' Wal*Mart. 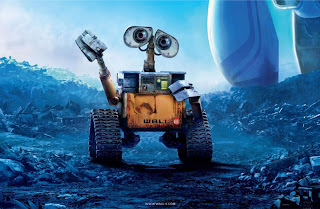 He meant Wall-E. See him? Look closely. How about now? There, hidden behind the flag pole. See him? It's Wall-E!! In honor of Earth Day, I bring you "Wal*E", together we will save the world. I adore Flylady. I consider her a mentor. However, I can't follow her rules. Well, one rule in particular. She insists that you wear shoes; lace up shoes that you can work in. I see the wisdom in this rule and know it would be beneficial if I obeyed it. But you see, I am a barefoot girl to the depths of my core. Cracked heels and blackened, leather soles, that's me. Not only do I love to run around like a heathen with no shoes on, I also depend on my toes...a lot. My toes are like another set of hands to me. I use them to pick things up off the floor on a regular basis. I'm sure I'd weigh a whole lot less if I actually expended the effort to bend over and pick up that piece of garbage, but nah, I'll stick to my toes pinching it and offering it to my hand. I didn't realize how much I used my toes until I saw my baby daughter placing one foot on the open dishwasher door. I thought she was just trying to stand on the door to reach something off the counter, until I noticed she was trying to shut the little soap door with her foot. Yep, I do that. I pour in the soap, then scoop the little door up between my toes and shut it. Then with a flick of the foot, I close the whole dishwasher, press start and I'm ready to go. Why am I going off on this today you ask? Because being the accident prone person I am, I managed to hurt myself with my strange cleaning acrobatic dance. LOL!! Yep, I picked up a piece of garbage with my toes, brought my foot up to my hand, and didn't judge the distance between my hand and foot. I slammed my hand into my foot and jammed my poor little thumb. It's still aching and I'm having a little bit of a hard time typing. Who hurts themselves like that?! Only me folks, only me. My neighbor served these at a party she hosted the other night. I have a new favorite treat! Bananas, frosted with strawberry frosting, rolled in coconut. Um....yummmy! She also had some that were rolled in crushed berry flavored cereal (like Count Dracula or something), those would surely be a big hit with the kiddos. We tried a new dish this week. Carter and I saw it on Rachel Ray so we decided to give it a whirl. She calls it Pizzagna (lasagna pizza combo), we just called it Pizza Pasta. It was quick and tasty and the kids liked it, so I call it a success. Not gourmet by any means, but a great one when you need something homemade and fast. My camera battery was dead so I didn't get a picture, but here's the recipe. I differed it from Rachel Ray's version only because she made her own sauce, I just used Prego. Cook pasta, save a cup of the starchy water. Mix ricotta, Parmesan, and pepperoni. Add water and mix. Add cooked pasta to cheese mixture. Pour in 9x13 pan. Pour spaghetti sauce on top, cover with mozzarella. Bake @ 350 for 15-20 minutes until cheese is melted. No wonder I have gray hairs! While I was fixing my hair today, I heard Carter and Kate playing "Easter Egg hunt" in the living room. I didn't think anything of it, until I went downstairs and saw the backdoor open and the empty carton of what should have been RAW eggs sitting on the floor. I asked Carter where the eggs were and he pointed to the backyard. Then he said that he and Kate had thrown them over the fence. Let me just pause for a moment and explain to you how much the man that shares our fence with us does NOT enjoy living by us. He's nice enough and has never done anything out right mean or rude. But, he HATES our dog. Hates is probably not even a strong enough term. And I think he feels almost that same emotion for our noisy, dirty children. When we first moved here, Carter who was not quite two, got out of the house and ended up in this man's backyard. He didn't find it amusing at all and quickly built a fence so no wandering children could get into his yard. His backyard is the most amazing yard I've ever seen. It's two levels (dug out) of full grown forest in a city neighborhood. I understand that it is his sanctuary and I do my best to respect that. I try not to let the dog bark too much (an impossibility) and make sure the kids don't scream past bedtime. Pretty much, we just try to keep our distance. Anywho...after hearing Carter's words I grabbed a chair and peaked over the fence. Sure enough my kids had egged the neighbor. There were about 5 raw egg shells and splattered yolks all over the place. I wanted to crawl in a hole and die!! Oh my word!!! What were they thinking???!!! And not only did they egg him with raw eggs, but see that blue egg clear back by the a/c unit? Yah, it says, "Carter" on it. My neighbor isn't home, and I can not find a latch on the fence anywhere to get in and clean up the mess. I am just dying. Carter has practiced saying, "I'm sorry Mr Smith" about 30 times and now we just sit and wait until he gets home from work. Oh the joys of a son. I didn't think I'd be dealing with vandalism until he was at least a teenager. Give me strength! Update: We've since talked to the neighbor and cleaned up the mess. I was SOOO redfaced and embarrassed. And he was very kind and understanding. He even took me on a tour of his beautiful backyard. Okay....I feel much better now. My body is a temple. Yesterday while shopping at Target, Carter told me that his tummy was hurting. (I think he was just hungry.) So then he said, "I think my temple is trying to come out." Carter- "You know...my temple. My teacher says there is a temple in our bodies." I think I laughed so hard the entire store heard me. You will often hear an LDS person say, "Our bodies are temples." Which simply means, we should treat them with honor and respect, the way we treat our actual temple buildings. So funny how kids take things literally. And on a different note, T-I-T will be Thursday this week. I've got a Rachel Ray meal that I'm going to try tonight. We had a very nice Easter weekend. Saturday we dyed eggs (4 dozen) with Grammy. And lest you all think I'm crazy for letting each child dye a dozen eggs a piece, I'll have you know that we have less than one dozen left. We probably lost about 8 eggs with the dropping, spoon racing and what not, but the rest have been eaten by my kids. They love boiled eggs. Carter was so funny when he walked in the kitchen and saw the pot with the eggs boiling away. He said, "Mmmmm....it smells like roasted eggs in here. 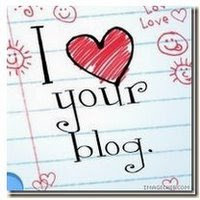 I love dose things!" But as much as they love the eggs, I'm tired of my house smelling like a sulfur pot, so I won't be sad tomorrow when the last have been gobbled up. We had to get a few pictures in our new Easter clothes and with our baskets. These two girls love nothing more than a good photo shoot. They come up with more poses than you can imagine. And you better bet your bottom dollar that these two little rascals will demand a photo shoot if the big girls get to have one. The little squirts, I just want to pinch their cheeks off. For all you primary choristers out there here is an idea (for senior singing time) that I used today and have used in every ward I've been chorister in. It has been a hit in all 3 wards. I just pull out the songbooks (and so far every building has had a big stack of them, either in the library or the primary closet) hand them to the kids and let them sing with the words right in front of them. You would be surprised at how much they like this. You can sing all the versus of songs they barely know (which works well for holiday songs that are rarely sung) and the kids really will sing along. It's a nice change for them to just be able to read the words and sing, instead of trying to memorize. There are two things that I absolutely CAN NOT resist come Easter time. 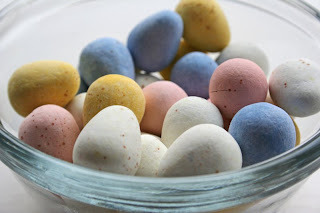 Now I know Cadburry eggs have started to come out at different seasons recently, but I refuse to buy any until Easter. Just seems to make them all the more special to me. I am also aware that I can get Reese's peanut butter cups all year round. 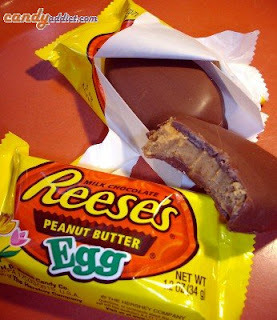 However, the eggs are the VERY best version of this candy. (The full size ones.) The ratio of chocolate to peanut butter is perfect and you can guarantee I'll eat at least 6 every Easter season. Do you have an irresistible seasonal candy? And I have to write this funny from Kate down. Yesterday she found a map from Disneyland in the car. She also found the Jehovah's Witness pamphlet that was left on the front door. It had a picture of Christ on the front and she carried it around for quite a while talking about Jesus. Then she said, "Mom, is Jesus at home in Disneywand?" Oh dear....apparently we need some lessons at this house. Yesterday at the Wal*Mart parking lot, Halle was intently looking at license plates on various cars. I asked her what she was doing and she said, "Mom, where does it say the name?" Halle- "You know....their name. Like Jack or something." Note to myself...don't say, "Get out of my way you big Jack," while driving with Halle. LOLLLL!!! Today, he just took off like he's been riding all winter long. So cute to watch. He absolutely loves it! And second, the Big Wheel met its demise when Kate and the neighbor boy crashed. Luckily no one was hurt. But all things considered, it was a very good day. This weekend we had the rare opportunity to take the girls (I often split my kids into two separate groups, the girls and the little kids) anyway, we took the girls to Salt Lake City to attend a session of General Conference. The little kids stayed with Grammy and kept her nice and busy. Halle has been so excited ever since we told her we were going to get to see the prophet in person (instead of on t.v. like we normally do every 6 months). She kept saying, "I can't wait until we get to see him live!" LOL! I'm not entirely sure she didn't think he was going to get up and sing and dance for her. She's such a crack up. It was such a neat experience for all of us. To see so many people in one place who share our same beliefs, to walk through the shouting anti's outside of temple square, and to feel the hushed reverence of the audience as our beloved prophet walked into the conference center. About 25 minutes into the 2 hour meeting, Halle (who is our wiggly one) leaned over to Jarom and said, "Give me your best wild guess as to how long this is going to take." LOL!! Yeah, it got a little long and boring for the girls but they did really good and tried their best to be reverent. I'm so glad we got to spend time with just the two of them, even though I missed the little kids something terrible. And I am so glad they got the privilege of being in the presence of our church leaders. What a neat memory for them. Kate came down the other day looking like an orange oompa-loompa. Like any good blogging mother, I grabbed my camera and took a picture. It wasn't just her face, but her entire torso, front and back. Then I heard Carter, "Mommy take a picture of my marker too." I hadn't seen him yet, but could only imagine what he was going to look like. They had been playing so well together, I should have known they were up to something. Hmmmmm....that's it? A smiley face on his hand? I wonder how he came out so unscathed? Uhhhh...Maybe because he was the little devil that did all the coloring!! I've never been one much for April Fools. Probably because I could never think of anything good enough to trick people with. I did trick my kindergarten teacher and told her I was moving and couldn't come to her class anymore. I also remember spending the night (when I was really little) with my cousin Tonya, when she was at college, dating her soon to be hubby Bill. I told him there was a lizard in his hair and he obliged me with a good squeal. But that's about it as far as pranks in this house. I thought about posting an ultra sound pic and tricking you all into thinking I was pregnant, but (a) my husband would think that was NOT funny, at all, and (b) Kat stole my thunder. Unless of course she's really pregnant and then the joke's on her! LOL! !